DAYTON, Ohio – With a removal rate that approaches 99 percent, packed tower aeration systems are a popular option for eliminating volatile organic compounds from ground water. When the City of Dayton’s [Ohio five packed tower aeration systems - installed in the late 1980s - began to fail, it needed a fix that could restore the structures to like new condition in performance and appearance. 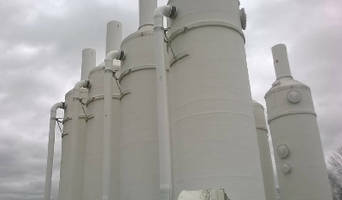 Dayton officials turned to FiberSystems for a Fiber Reinforced Plastic (FRP) composites solution. FiberSystems leads the industry as a custom manufacturer of Fiberglass Reinforced Plastic composite parts in a wide range of sizes for structurally demanding applications and corrosive environments. With nearly 70 years of fabrication and engineering expertise, FiberSystems combines specialized resins knowledge, innovative design and materials, manufacturing technology and restoration services to support a diverse product lineup that includes pipe, fittings, duct work, containment systems, tanks, pipe supports and items like pultruded structural shapes, flooring systems, grating and coatings.